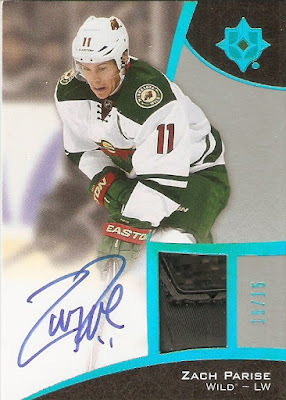 The great thing about being a Zach Parise collector, is that his cards are very affordable. I picked these up a while back, and I can't remember exactly how much I paid, but I was very happy with my purchase. The first card is from 2015-16 Ultimate. I think what they did a lot of with this set for the hits was take the base cards, and throw an autograph here, and a memorabilia piece there, and there ya go. With this one, we have a really low serial number (15/15) combined with an on-card autograph, and a memorabilia swatch, which I'm pretty sure is a piece of a skate. Any time I can get a piece that is something besides a jersey, I definitely grab it up. The next one isn't quite as spectacular, but one I'm still happy to add to the collection. From 2016-17 SPX's Impressions insert, this one is numbered 20/99, and features a sticker autograph of Parise. Sure, it isn't as flashy as the other one, but for just a couple bucks, I'll take it! That's it for now. I'm sure I'll be picking up plenty more in the near future, adn will certainly show them off when I do.